A virgin and martyr whose feast is celebrated in the Latin Church and in the various Oriental churches on 25 November, and who for almost six centuries was the object of a very popular devotion. Of noble birth and learned in the sciences, when only eighteen years old, Catherine presented herself to the Emperor Maximinus who was violently persecuting the Christians, upbraided him for his cruelty and endeavoured to prove how iniquitous was the worship of false gods. Astounded at the young girl's audacity, but incompetent to vie with her in point of learning the tyrant detained her in his palace and summoned numerous scholars whom he commanded to use all their skill in specious reasoning that thereby Catherine might be led to apostatize. But she emerged from the debate victorious. Several of her adversaries, conquered by her eloquence, declared themselves Christians and were at once put to death. Furious at being baffled, Maximinus had Catherine scourged and then imprisoned. Meanwhile the empress, eager to see so extraordinary a young woman, went with Porphyry, the head of the troops, to visit her in her dungeon, when they in turn yielded to Catherine's exhortations, believed, were baptized, and immediately won the martyr's crown. Soon afterwards the saint, who far from forsaking her Faith, effected so many conversions, was condemned to die on the wheel, but, at her touch, this instrument of torture was miraculously destroyed. The emperor, enraged beyond control, then had her beheaded and angels carried her body to Mount Sinai where later a church and monastery were built in her honour. So far the Acts of St. Catherine. Unfortunately we have not these acts in their original form, but transformed and distorted by fantastic and diffuse descriptions which are entirely due to the imagination of the narrators who cared less to state authentic facts than to charm their readers by recitals of the marvellous. The importance attached throughout the Middle Ages to the legend of this martyr accounts for the eagerness and care with which in modern times the ancient Greek, Latin and Arabic texts containing it have been perused and studied, and concerning which critics have long since expressed their opinion, one which, in all likelihood, they will never have to retract. Several centuries ago when devotion to the saints was stimulated by the reading of extraordinary hagiographical narrations, the historical value of which no one was qualified to question, St. Catherine was invested by Catholic peoples with a halo of charming poetry and miraculous power. Ranked with St. Margaret and St. Barbara as one of the fourteen most helpful saints in heaven, she was unceasingly praised by preachers and sung by poets. It is a well-known fact that Bossuet dedicated to her one of his most beautiful panegyrics and that Adam of Saint-Victor wrote a magnificent poem in her honour: "Vox Sonora nostri chori", etc. In many places her feast was celebrated with the utmost solemnity, servile work being suppressed and the devotions being attended by great numbers of people. In several dioceses of France it was observed as a Holy Day of obligation up to the beginning of the seventeenth century, the splendour of its ceremonial eclipsing that of the feasts of some of the Apostles. Numberless chapels were placed under her patronage and her statue was found in nearly all churches, representing her according to medieval iconography with a wheel, her instrument of torture. Whilst, owing to several circumstances in his life, St. Nicholas of Myra, was considered the patron of young bachelors and students, St. Catherine became the patroness of young maidens and female students. Looked upon as the holiest and most illustrious of the virgins of Christ, it was but natural that she, of all others, should be worthy to watch over the virgins of the cloister and the young women of the world. The spiked wheel having become emblematic of the saint, wheelwrights and mechanics placed themselves under her patronage. 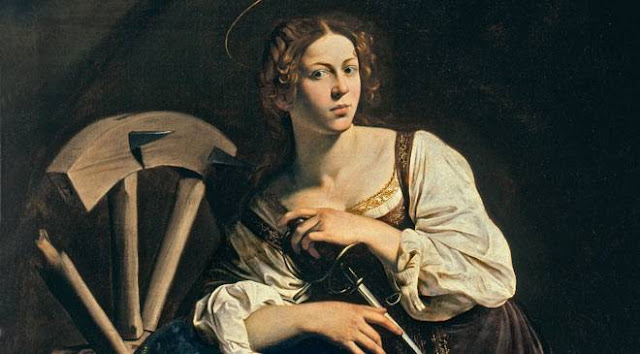 Finally, as according to tradition, she not only remained a virgin by governing her passions and conquered her executioners by wearying their patience, but triumphed in science by closing the mouths of sophists, her intercession was implored by theologians, apologists, pulpit orators, and philosophers. Before studying, writing, or preaching, they besought her to illumine their minds, guide their pens, and impart eloquence to their words. This devotion to St. Catherine which assumed such vast proportions in Europe after the Crusades, received additional eclat in France in the beginning of the fifteenth century, when it was rumoured that she had appeared to Joan of Arc and, together with St. Margaret, had been divinely appointed Joan's adviser. Although contemporary hagiographers look upon the authenticity of the various texts containing the legend of St. Catherine as more than doubtful, it is not therefore meant to cast even the shadow of a doubt around the existence of the saint. But the conclusion reached when these texts have been carefully studied is that, if the principal facts forming the outline are to be accepted as true, the multitude of details by which these facts are almost obscured, most of the wonderful narratives with which they are embellished, and the long discourses that are put into the mouth of St. Catherine, are to be rejected as inventions, pure and simple.